Habit at Hawaii Tropical Botanical Garden, Hawaii. July 16, 2012. 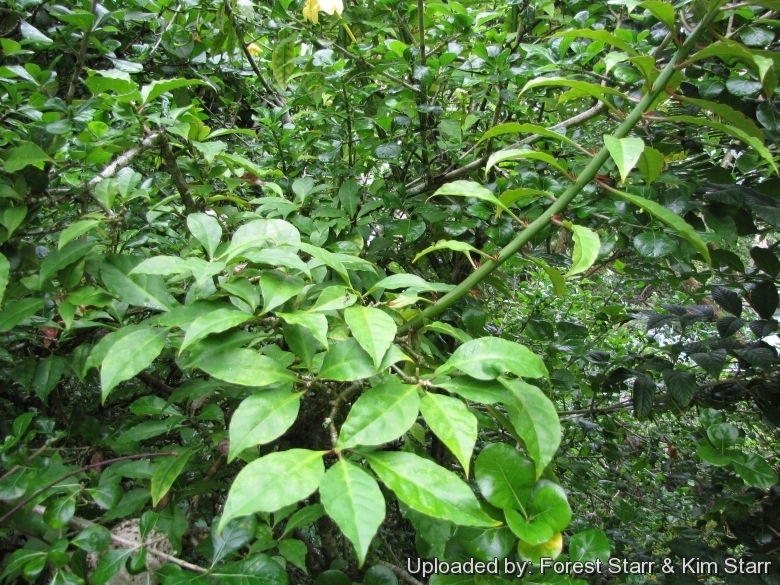 Origin and Habitat: Pereskia bleo occurs in Colombia and Panama. Altitudinal range: It grows at altitudes between sea level and 1,300 metres above sea level. Habitat and Ecology: This species grows on sandy margins of rivers in humid tropical evergreen forests and in secondary forests. Pereskia bleo is not threatened because of its wide distribution, number of locations, its occurrence in inaccessible places, and its wide cultivation for use as a hedge. 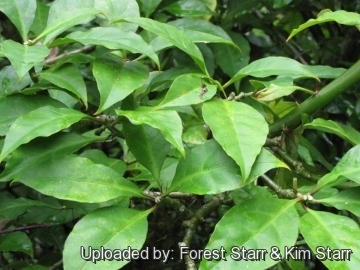 Description: Pereskia bleo is usually a shrub or small tree, but sometimes half-clambering, 2-8 meters high. The cylindrical stem is covered with large spines. The pretty bright orange/red flowers appear continuously and resemble single rose blossoms. Stem: Trunk 15 cm in diameter or less, smooth, olive green to brownish grey, when old becoming naked, but young shoots often bear large fascicles of spines (sometimes as many as 40) up to 20(-25) mm long; young branches red, leafy, its spines in fascicles of 5 and 6, but twigs (young shoots) often bear but (0-)1 to 4(-5), black, acicular spines, 5-10 mm long. Venation pinnate, lateral veins 4-6 and often bifurcate. Leaves: Thin, elliptical, oblong to oblanceolate, 6 to 21 cm long, 2 to 7 cm wide, acuminate, cuneate at base, tapering into petioles 2 to 3.5 cm long. Areoles Circular, bearing when young a little wool, but soon becoming naked. Flowers: produced terminally and laterally in inflorescences, naked, bright red, scarlet, salmon, or orange-red, 4-6 cm(1.6-2.4 in) in diameter, calyx turbinate, somewhat angled, naked and top shaped, with linear deciduous sepals; petals 12 to 15, rose-colored, obovate, 3.5 cm long; style longer than the stamens, red, thick; stigma-lobes 5 to 7; ovary depressed. or with one or two bracts on the rim, yellow at maturity. Seeds: 6 mm long, black, shining. 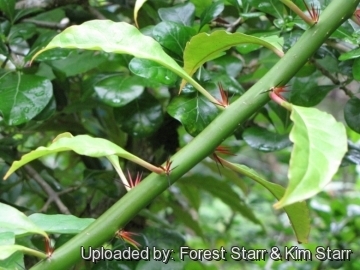 1) Forest & Kim Starr “Pereskia bleo (Rose cactus)”. Plants of Hawaii. <http://www.starrenvironmental.com>. Downloaded on 20 August 2014. 9) Griffith, P., Gann, G.D. & Nassar, J. 2013. Pereskia bleo. The IUCN Red List of Threatened Species. Version 2014.2. <www.iucnredlist.org>. Downloaded on 25 September 2014. 12) Malek SN, Shin SK, Wahab NA and Yaacob H. "Cytotoxic components of Pereskia bleo (Kunth) DC. (Cactaceae) leaves", Molecules, 14(5):1713-24. 2009. 13) Charles A. Butterworth and Robert S. Wallace, "Molecular Phylogenetics of the Leafy Cactus Genus Pereskia (Cactaceae)", Systematic Botany 30(4):800-808. 2005. 14) Beat Ernst Leuenberger, "Pereskia, Maihuenia, and Blossfeldia —Taxonomic History, Updates, and Notes", Haseltonia 14 : 54-93. 2008. 15) Correa A., M. D., C. Galdames & M. N. S. Stapf. 2004. "Cat. Pl. Vasc. Panamá" 1–599. Smithsonian Tropical Research Institute, Panama. 16) Idárraga-Piedrahita, A., R. D. C. Ortiz, R. Callejas Posada & M. Merello. 2011. "Flora de Antioquia. Catálogo de las Plantas Vasculares" vol. 2. Listado de las Plantas Vasculares del Departamento de Antioquia. Pp. 1-939. Cultivation and Propagation: Nearly indestructible, Pereskia bleo requires full sun or light shade (but withstand dense shade) and well drained soils, preferably rich neutral organic soils, but may tolerate acidic ones. Hardiness: Considered frost tender, but surprisingly cold hardy outdoors and also very sun hardy for a succulent plant. It likes warmth (recommended minimum winter temperature 10° C) however plants kept perfectly dry can can survive low temperatures, approx. to -3°C., but for safe cultivation it is best to avoid freezing temperatures. In presence of high atmospheric humidity avoid any frost as it is particularly sensitive to root rot. Deciduous below 4°C. Uses: The species is used as an ornamental in some parts of its range . In Colombia it is used as a natural hedge and crushed leaves have been used to clarify drinking water. In Malaysia, the leaves are used to treat cancer, high blood pressure, diabetes and diseases associated with rheumatism and inflammation. A decoction of the leaves is used as a warm bath to treat muscle aches. A remedy prepared from the inflorescence is drunk as a remedy for the relief of gastric pain, ulcers and for revitalizing the body. The leaves are either consumed raw or made into a concoction brewed from fresh leaves. Methanolic extracts of P. bleo have been found to induce apoptosis in breast carcinoma cells .